This Tasty Bite Channa Masala classic Indian recipe is a favorite in most Indian restaurants. They slow-simmer chickpeas in a delicious blend of onions, tomatoes, and aromatic spices. Enjoy as a hearty dish on its own or accompany with naan, roti, or your favorite rice. I keep this and the other varieties at work for my lunches. Great flavours and textures. I mix it with other varieties for a great lunch. I don't find them too salty. Makes a tasty side dish to your main course. The varieties of Tasty Bites (other then the Bengal Lentils and this one) seem to be mostly sauce and I will avoid them. Warning: fairly high salt content per serving. I still love this Channa Masala as much as when I first tried it last year. I will continue to purchase it at Well.ca since I haven't found it in Montreal stores yet. I was somewhat disappointed. It started off tasting fine but then I found the chick peas too firm. I was not able to finish the whole pack, sorry I will skip this item for now. I tried all the Tasty Bite flavours and this one is my favourite. 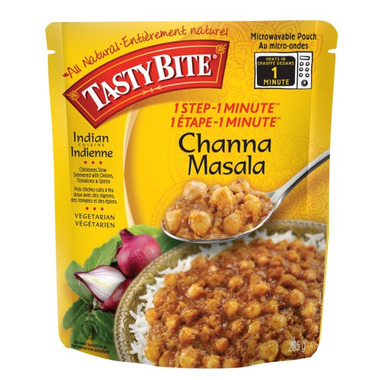 I just bought 15 more Channa Masala's with my recent order because it was the lowest price Well.ca has offered so far. I eat it on a bed of basmati rice or on a bed of mashed potatoes.